Homepage Mobile Phones Motorola Doogee S70 announced! You’ve probably heard of Chinese smartphone manufacturer Doogee before. They’re creating a ton of cheap devices that offer decent internals for an extremely low price. Furthermore, they’re one of the few Asian companies that offer their smartphones in most western countries. And that is without the help from importing sites like AliExpress. Now, they’ve announced their latest device, aimed at the gamer group of consumers. Meet the Doogee S70 – let’s see what it’s capable of! 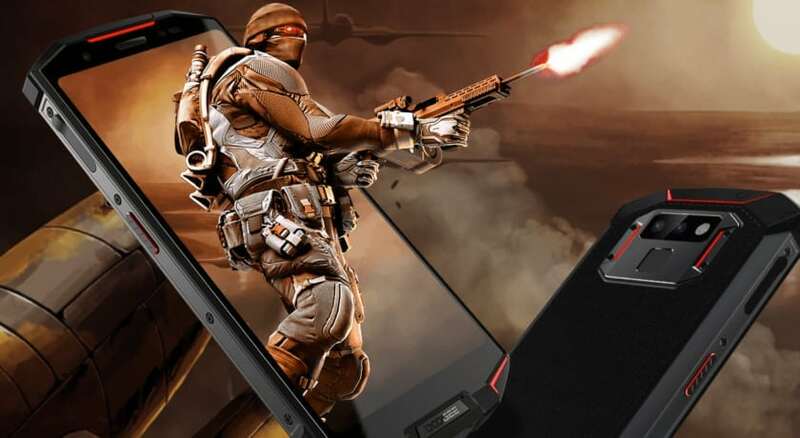 Starting with the design, the Doogee S70 is definitely trying to appeal the gaming community. The rugged shell of the device is the main reason for that – bold lines and little to no curves. There is also a small leather patch on the back for extra grip. On the front, you will find the 6” IPS LCD display with 1080 x 2160 resolution and 18:9 aspect ratio. The panel is great, with good brightness. The 18:9 aspect ratio gives you the trendy look, but you’ll still find the bezels around it. After all, this is a gaming phone, so the extra space is quite useful during gaming. On the back, you will find the camera setup in the top, with the fingerprint sensor right under it. Digging into the internals, the S70 is definitely not a flagship killer. Starting with the chipset, the device features the MediaTek Helio P23 processor. The 2.5GHz octa-core chip is pretty decent, but it was introduced last year. Nevertheless, alongside the Mali-G71 GPU, they should handle most tasks decently. For memory, you’re getting 6GB of RAM and 64GB of internal storage. A pretty decent package that should run most of today’s games without any problems. And if you’re worried about storage, you have a MicroSD card slot available. Finishing with the battery, this is where Doogee focused the most. The S70 features a 5500mAh battery, which is much bigger than other gaming branded smartphones. This should easily last you through two to three days, depending on usage. Moving over to the cameras, the Doogee S70 features a dual camera setup on the back and a single shooter on the front. The dual setup is consisted of a primary 12MP shooter and a secondary 5MP shooter. Both have f/1.8 aperture, and the second one is used as a depth sensor. Compared to other Doogee smartphones, we’re expecting decent pictures, but nothing special. On the front, there is a 16MP selfie shooter from Samsung. It’s more than enough for all of your selfies or game streaming sessions. Finishing with the software, the S70 comes with Android Oreo 8.1 out of the box. It has the company’s own skin on top, which completes the look of a gamer (I guess). There are also many different modes and features, including the game mode. This mode has its dedicated hardware button and blocks notifications and sounds, plus clearing the RAM from the other apps. Unfortunately, there is no information about the price or availability of this device. But, we’re expecting to see it on online retailers like Amazon in the upcoming period. So, what are your thoughts on the Doogee S70? Share them in the comments below. Previous article Previous post: Motorola Moto Z3 released! Next article Next post: Vivo X23 launched!